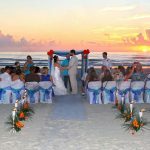 The best time to plan a beach or destination wedding is when YOU want it. Here is info to help you decide. Sometimes couples want the same date as when they were engaged, or their parents anniversary or other special dates. Visualize what your wedding theme and vibe will be. This will help you pick a season. If it is fully decked with formal wedding dresses and bridesmaids dresses, and tuxedos or suits, this may guide you to a cooler month. It may. Although we have done those in July with heat index of 110. If you will be super casual with shorter summer dresses, bare feet, men wearing linen outfts or shorts then the summer months will be fine. If you are having a reception, making sure the venue that you want is available, at any month or time is vital. Plan well in advance for this to increase your odds of booking the right venue. Spring – Great for Sunrise Ceremonies. Great for On Beach Receptions. First two weeks of Feb great for cooler beach or destination weddings. Still off season and winter. Bike Week is March 8-17, 2019 with 500,000 people (most with motorcycles) coming into our area. Hotels and all restaurants booked. Beach is OK, not that busy during this event. March is a great beach wedding month but if April is a better bet here, but it fills up quickly so plan ahead. Easter is semi – busy and occurs on April 21st 2019. School is still in session until May 20th or so. Still off season, the last of it. May 1st is Turtle Nesting season for us. In other locations, find out their specific regulations and other seasonal topics. In Volusia County Florida, we have turtle nesting season. It starts May 1st an ends October 31st. This means that no equipment or lights can be on the beach before sunrise or after sunset. People can, but nothing else. 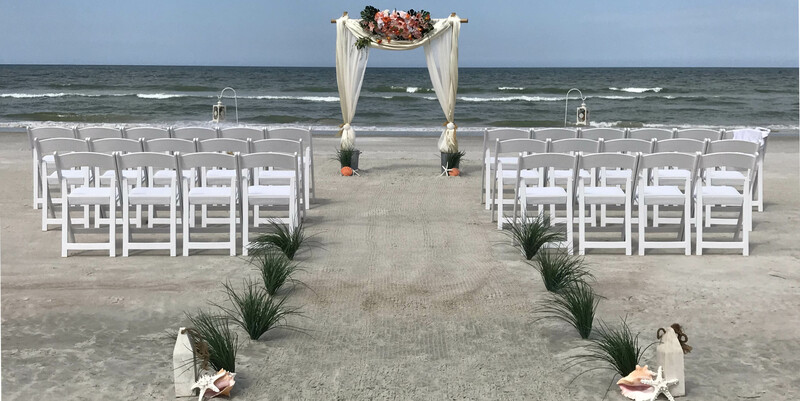 Spring weddings have full flexibility for sunrise setups and parties with lights on the beach, Can you do it for this amount? Yes but you set the budget based on working with the wedding planner. June is the wedding month of the June bride! June is our busiest month with events. Hot, morning weddings before 11am are great. Later in evening. While many areas of the country start cooling down, we are still in dead of summer! Still hot and your body is ready for fall! Off season begins, pricing for hotels goes down, availability goes way up. restaurants less busy. Off season, pricing for hotels goes down, availability goes way up. restaurants less busy. Biketober Fest is another Motorcycle event like Bike Week but much smaller (only 150,000 motorcycles) and shorter in length. In 2019 it is 10/18-10/21. 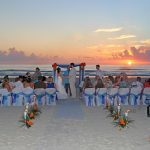 Turtle nesting season is over so sunrise weddings with setups and evening receptions/parties on the beach are OK! Busy in-season on east coast of Central Florida starts in 2nd half of February and ends by Labor Day. Start by picking the date that YOU want, unless you have total flexibility, and then the planner will provide you with great options.